THE IMPORTANCE OF BURNT CHRISTMAS COOKIES: The photo below seems almost normal, but not quite. (Much like myself). 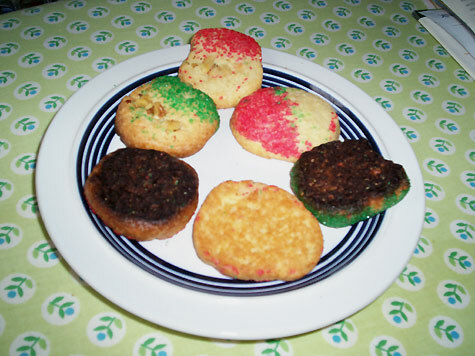 The subject of the photo is a plate of cookies, sugar cookies decorated for Christmas. Most of the cookies look OK, but what’s with those two ugly dark things? Well, those are the undersides of some cookies that I intentionally left in the oven a bit longer than most people would prefer. (The one between them is the bottom of an un-burnt cookie, for comparison sake). Every year I continue my mother’s holiday tradition of making sugar cookies with decorative sprinkles (and some walnuts, as I like cookies with walnuts). My mother wasn’t exactly a gourmet chef, and her stove didn’t have precise temperature control. So, she often let her cookies bake too long; there would always be a lot of “burnies” in the cookie tray. But did that stop us kids from eating them? Of course not. If they were anything more than pure ashes and cinders, we’d wolf them down. I’m not exactly a gourmet chef either, but I now have a two-layer cookie sheet that makes it easy to get the timing just right. But nonetheless, every year I still get out an old flat sheet and singe a dozen or so. Why? Because it brings back memories. I mean, not every cookie needs to taste just like it came from a professional bakery. When you eat a burnt cookie, you get a mix of the bitter and the sweet. As such, those burnt cookies are a good representation of my youth -- in more ways than one. Ah, yes, there is nothing like the cooking our mother's did for us when we were kids. I don't care how old we get to be; at certain times of the year we still think back to the cooking we had when we were kids. My brother, over these holidays, for some inexplicable reason, asked my sister for my parents' recipe for fruitcake. I almost fell out of my chair that he remembered. I tho't I was the only one. Yes, I know, everybody makes jokes about fruitcake--but not in our family. Fruitcake was a special treat remembered by each of us (even my bro). So, burnt cookies being a special treat for Christmas do not surprise me one bit. My sister (who died 8 years ago now) was the last of the line to make the family fruitcake recipe. I still miss the portion she gave me at Christmas. I also had a cousin (also who recently died) who made what we called "boggle"--an Austrian kind of bread. Again, with her death there is no more "boggle." So, I truly appreciate your burnt cookies at Christmas. I hope you savor and enjoy each one of them.